Being a Cancer born on July 19th, you are known for your compassion, sensitivity, intuition and optimism. While others struggle within the realm of emotions, you cannot relate, as you understand the inner workings of yourself and others with ease. You always have the right thing to say when people are in need. Likewise, in situations that seem particularly bleak, you have the ability to see the bright side. These qualities are greatly appreciated by those close to you and are the reason you are such a highly coveted friend. Water is your paired element and out of all 12 zodiac signs, you have the most fundamental connection with the element. The influence of water is heavily tied to emotions, as you often experience emotions in strong waves. Riding the rocky, forceful waters of emotion have allowed you to take great understanding from your experiences, which in turn, allows you to show compassion to those on similarly troubled seas. Embrace these qualities of water to grow as an empathetic individual. Be aware of the negative qualities of water, as becoming fully submerged in your emotions may result in moodiness. The planetary ruler of your sign is the moon, but because you were born in third Decan, or part, of the sign, you also experience the influence of Neptune. The moon’s influence is materialized with your keen sensitive and nearly psychic intuition. In turn, Neptune’s planetary force is seen in your active imagination and connection to all that is spiritual. The combination results in you being a romantic and a dreamer at heart. In life and in love, you derive great excitement from imagining possibilities. In times, your imagination is so active that reality pales by comparison. When this occurs, you rely on your optimism to evict negative thoughts from your mind; this is one of your greatest strengths. Be aware that imagination does not come without its dangers, as you run the risk of using it to escape from the real world. 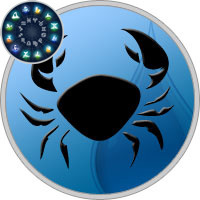 July 19 Cancers are quiet and inscrutable. They possess a generally sweet temperament and a true love of people. They don’t try to grab the spotlight, though they’re often thrust unwillingly into it. July 19 people are sentimental about their relationships. They keep the same circle of friends for many years.